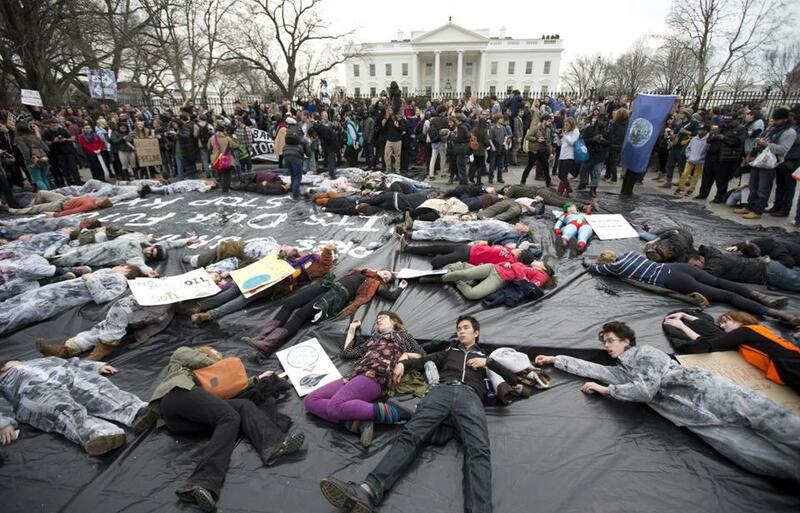 Demonstrators lay down in front of the White House during a protest against the proposed Keystone XL oil pipeline. Last weekend, I was arrested on President Obama’s doorstep. I joined 397 others at the White House fence for an act of environmental civil disobedience. We were arrested to show the president our generation’s determination to stop the dirty and dangerous Keystone XL tar sands pipeline. But my history with President Obama didn’t start on Sunday. I put school on hold for a semester and moved to Derry, N.H., to work on his reelection campaign in 2012. Like thousands of other young staffers and volunteers, I knocked on doors, made calls, and built teams of people committed to doing everything they could to ensure Obama remained in the White House for another four years. From the high school students I picked up after school to the retirees who never missed a volunteer night, I was inspired by people of all ages who were all in and ready to donate countless hours to talking to their neighbors because they believed in the president and his vision for our nation. These volunteers found a community working together for a candidate they loved. They built bonds that last longer than an election cycle and still are in touch. I was all in too, working as a field organizer seven days a week because I trusted Obama to take the threats climate change presents to my future seriously. Now two years later, I’m not convinced. We voted for a president who promised to “free America from the tyranny of oil” and understood the impact climate change would have on my and future generations. But we have yet to see the sort of change we can believe in. Instead we see a president who continues to cave to the fossil fuel industry. I’m not alone in demanding that Obama rejects Keystone XL. Last spring, when it looked like a decision on the pipeline might be imminent, more than 150 former Obama campaign staff mobilized in just a few days, and called on the president to take a stand for us and reject Keystone XL. And now my volunteers too are calling for the president to take action, sending me messages of support as I strive to hold the President accountable. This doesn’t even account for the thousands of students who volunteered for the campaign, knocking on doors, making calls, and showing up to the polls in record numbers for a president we thought would move us forward. 79% of young voters say they will vote for a candidate who will take action on climate change, and 73% say they will vote against a candidate who won’t. Even 47% of young Republicans would vote against a climate denier. And more members of my generation are turning 18 every day, making “millennials” a larger and larger proportion of the voting population. Obama promised this summer not to condemn my generation and future generations to a planet that is beyond fixing. He promised not to approve Keystone XL if it would significantly exacerbate the climate problem. But Keystone XL exacerbates climate problems, creating a gateway to the tar sands’ massive carbon footprint that extends from extraction to consumption. The Keystone XL decision lies in Obama’s hands. If he doesn’t stop the pipeline, we’ll look for avenues other than the ballot box to make our voices heard. Hannah Bristol worked on the 2012 Obama campaign in New Hampshire and is a senior at Middlebury College.